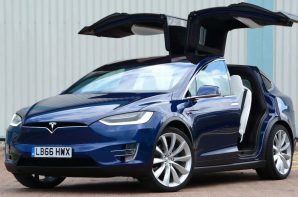 The Tesla Model X takes the brands unique approach to all electric motoring and supersizes it. The result is a near 2.5 tonne, all wheel drive, 7 seat SUV with ample performance even in the entry level specification. Surely that must mean a woefully short electric range and compromised dynamics? Well we all know that Tesla has the ability to deliver class leading electric range and the Model X is no exception. The 75D packs a big battery pack (75 kWh gross) which achieves 259 miles on the official tests and more importantly can deliver 200+ miles in the real world. The more expensive models with bigger batteries deliver up to 351 miles and Supercar humbling 0-60 times. Crucially when you do need to recharge on the go, you get to use Tesla’s bespoke Supercharger network which can only be used by Tesla cars. This makes for totally hassle free recharging, which integrates seamlessly with the onboard sat nav and delivers around 177 miles of extra range in 30 minutes. Once on the move the overriding sensation is of effortless torque and interior space. You get to choose between 5, 6 or 7 seat layouts to suit your needs whilst the clever ‘Falcon’ rear doors provide excellent access to the rear rows whilst simultaneously delivering an added wow factor in use and enhanced practicality in narrow spaces. There are a couple of areas where the Model X drops the ball, the first is handling, it is safe, predictable, and way better than you would imagine a 2.5 tonne SUV to be, but it isn’t engaging. To be fair there aren’t many in this class that are. The second point is material quality; the interior is well laid out and the central touchscreen display works very well, but the quality of the cabin materials isn’t up to European standards, particularly not at this price point. Another surprise is servicing. 12,500 mile intervals will come as a shock to diesel owners and the cost of servicing won’t go unnoticed either with the first 4 years costing £2,500 we can’t help but feel that Tesla is cashing in somewhat. Model X is another huge achievement from a very young company. It delivers performance and real world range, lots of interior space, clever design touches and through Supercharger access the best recharging network in UK.